WAIST HIGH: Live Aid Story To Become TV Movie. Live Aid Story To Become TV Movie. Waist High would like to say a quick 'thank you' to musical kindred spirit and good friend of the program Pratt for the reminder this week that it has been 25 years since Live Aid; the BBC said on Wednesday that the story behind Bob Geldof's concert, which took place on July 13, 1985, is being made into a TV film. 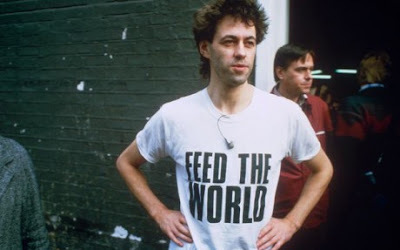 From The Hollywood Reporter: The 1985 concert, organized by Geldof and music promoter Harvey Goldsmith, reached an estimated 1.5 billion people and did much to raise the public and political profile of those suffering from poverty, starvation and disease in Africa. Filming has already begun in Dublin for the 90-minute drama "When Harvey met Bob," which follows the story from the moment Geldof arrived home to find his then girlfriend Paula Yates holding their baby and weeping as she watched television footage from feeding camps in Eritrea. Played by Domhnall Gleeson, who stars in the upcoming seventh Harry Potter film, Geldof persuaded a host of rock stars to give their name and talents for free to the Band Aid charity Christmas record "Do they know it's Christmas?" "We were inspired by this story because it has, at its heart, a fantastic relationship that is funny, moving and born out of the real drama of trying to achieve something huge and unprecedented," said Kate Triggs of producers Great Meadow Productions. "It's a film about two men who are prepared to think the unthinkable and achieve the seemingly impossible." The film, described as "humorous, warm, tension-filled and ultimately deeply moving" was commissioned to mark the 25th anniversary of the concert and will air on BBC 2 and Ireland's RTE in the autumn.